� 2017 SNAME. All rights reserved. To assist in predicting the performance of omni-directional propelled vehicles a series of experiments has been conducted to measure the interaction between two closely spaced ducted azimuthing thrusters. The thrusters were tested below a shallow draft ground board in a towing tank at a spacing of approximately 2 propeller diameters. 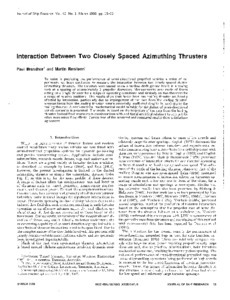 Measurements were made of forces acting on a single thruster for a range of operating conditions and similarly on two thrusters for a range of relative positions. The results show that forces from the trailing thruster are heavily affected by interaction, particularly due to impingement of the race from the leading thruster, whereas forces from the leading thruster remain essentially unaffected despite its proximity to the trailing thruster. A semi-empirical mathematical model suitable for simulation of omni-directional vehicle dynamics is presented. The model is based on the trajectory of the race from the leading thruster derived from momentum considerations with additional empirical relations to account for other more minor flow effects. Comparison of the predicted and measured results show satisfactory agreement.